If you have been enjoying filling, cozy comfort food this winter and need a bit of a break, this light, fresh, and fast zucchini noodle "pasta" recipe will brighten your day. With the help of a spiralizer kitchen tool (or alternatively a julienne peeler), whole zucchini is transformed into healthy, naturally gluten-free spaghetti-sized noodles. It doesn't take long for the zucchini noodles to cook, simply toss in a skillet with a hint of olive oil until heated through. 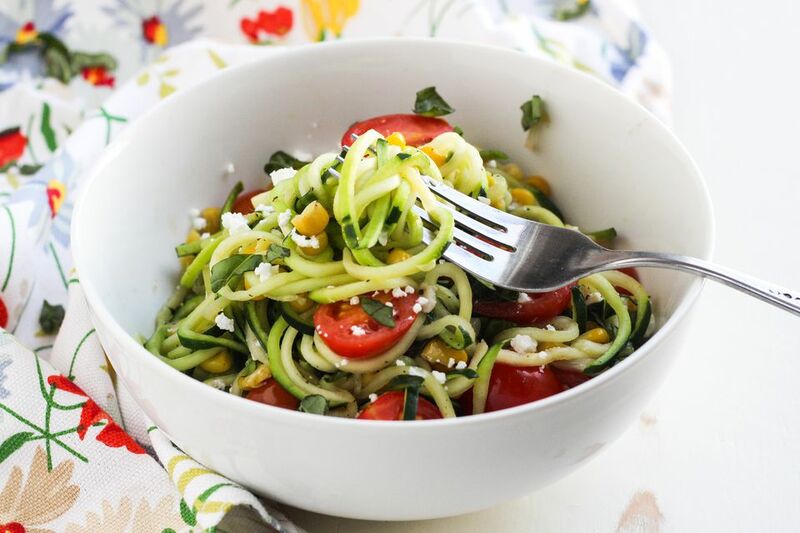 The zucchini noodles are paired with halved grape tomatoes and yellow corn sautéed with shallots and garlic. Crumbled goat cheese, softened by the heat of the cooked veggies, adds a tangy creaminess to the dish. Finish off this light and refreshing plate of "pasta" with fresh chopped basil and additional goat cheese for a healthy, filling weeknight meal. To bolster this dish with protein, add sautéed shrimp or strips of grilled chicken. With a spiralizer kitchen tool, spiralize two large zucchini into spaghetti-size noodles. If you don't have a spiralizer, you can use a julienne peeler instead. In a medium-sized skillet, heat the olive oil over medium heat. Add the shallot and cook until softened, about 2 to 3 minutes. Add the garlic and cook until fragrant, about 1 min. Add the corn, grape tomatoes, and basil. Season to taste with salt and pepper, stirring occasionally as you cook until heated through. When hot, turn off heat and sprinkle 1 tablespoon of crumbled goat cheese over top. In a separate large skillet, heat the remaining oil over medium-high heat. Add the zucchini noodles and toss as you cook (using tongs makes this easier). The zucchini noodles don't take long to cook—toss for about 3 to 4 minutes then add in the corn, tomato, shallot, and cheese mixture. Toss to combine then remove the pan from heat. (Note: If you julienned the noodles, only cook for 2 to 3 minutes as these noodles are thinner and cook faster than spiralized noodles). Divide noodle dish into two bowls, garnishing with remaining goat cheese and additional basil, if desired. Serve immediately. ​Note: You can add shrimp to this dish, or serve alongside grilled chicken.